If you are looking for the perfect, festive holiday treat, try this delicious Weight Watchers Gingerbread Recipe for your next holiday party. There is nothing like the taste of gingerbread around this time of year to make it really feel like Christmas, so I was thrilled to find such a low Points Christmas recipe to share! 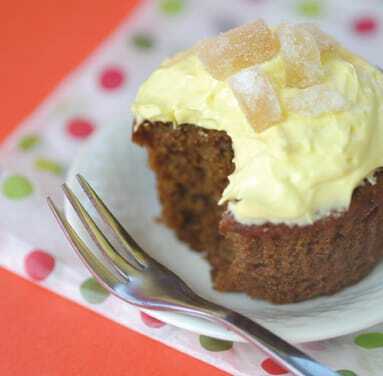 The thing I love about this holiday dessert recipe, is that they are gingerbread cupcakes, as opposed to the traditional gingerbread cookies, so it’s unique. PLUS, I love finger food desserts that don’t require me to sit down with a plate and fork. These little low calorie Christmas cupcakes are so tasty and incredibly cute, your guests will love them – and feel free to decorate them for a more festive touch! I also like to serve them with a nice, hot spiced apple cider. And with just 2 Weight Watchers Points per cupcake, this holiday gingerbread recipe is a MUST. Enjoy!